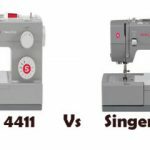 The Singer 4423 is a heavy duty, extra-high speed sewing machine. 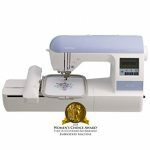 A heavy duty metal frame and powerful motor combined with the ability to sew 1,100 stitches per minute, makes this a powerhouse machine that can handle just about anything and within half the time that it would take you with most other machines! Add to it the slew of convenient features and what you have is a sewing machine that is powerful, fast and easy to use! 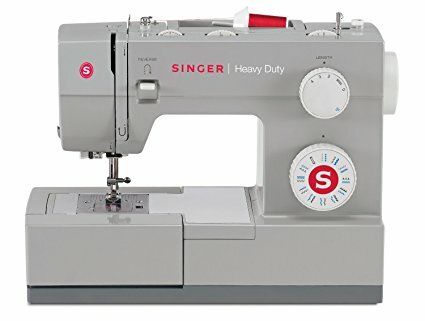 Powerful Motor Housed Within a Heavy Duty Metal Frame: With a motor that has 60% more power than any other home sewing machine , this heavy duty Singer sewing machine slices through heavyweight fabrics easily and the exterior is sturdy enough to support the rigors of heavy duty sewing without shaking or wobbling. 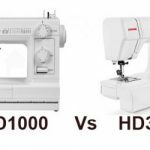 Extra-High Sewing Speed: The extra-high sewing speed of 1,100 stitches per minute helps you wrap up time consuming projects in a shorter time than it would take with any other conventional home machine. 23 Built-In Stitches & Fully Automatic One-Step Buttonhole: 23 built in stitches with a fully automatic one-step buttonhole offer unlimited project possibilities whether you are dabbling in decorative sewing, home decoration or fashion sewing. The buttonhole size can be customized to your preference. Presser Foot is Extra-High with Automatic Pressure Control: The higher than normal presser foot offers the additional clearance you need when sewing through multiple layers of bulky fabric and the automatic presser foot pressure adjustment means you can switch from sewing the heaviest denim to the sheerest chiffon without having to fiddle around with regulating the pressure. This is an absolute boon to sewers who multitask and engage in multiple projects across extended sewing sessions. Automatic Needle Threader & Easy Top Drop-In Bobbin System: Twohuge timesaving features. 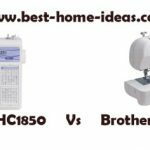 The automatic needle threader and the easy to use, top-loading bobbin make preparing the machine for sewing less tedious and less frustrating. The clear bobbin cover makes it easy to check the thread supply so you are always in the loop. Stainless Steel Bed Plate & Drop Feed Advantage: The stainless steel bed plate pushes the fabric through smoothly for more even sewing and the drop feed feature allows for more creative top stitching. This can be particularly useful when monogramming, sewing quilts and adding creative touches to your projects. Three Needle Positions with Adjustable Tension: The needle position can be changed to facilitate specific projects such as topstitching, cording and inserting zippers and the tension can be adjusted to ensure stable stitch quality irrespective of the fabric you are working with. Max Stitch Width of 5mm: Most stitches can be adjusted to a maximum of 5 mm, which creates bolder and wider stitches for a more dramatic effect. Free Arm with On-Board Storage: The free arm makes it easy to sew difficult to reach areas such as collars, cuffs and hems. Automatic Bobbin Winding Clutch: Bobbin winding is safer as the needle bar gets automatically disengaged. Some users complain that this model is not exactly “Heavy Duty” and does not handle super-heavy-duty projects. That’s debatable though. Any machine would have its limitations. 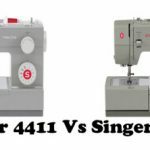 If you are looking for a machine that will help you master those big projects in a shorter time, the Singer 4423 is definitely for you!